Buy these lecterns online at https://www.storemorestore.com/Lecterns-and-Podiums-s/2000.htm. The open mobile lecterns and speaker podiums have an open design with an interior adjustable storage shelf and are mounted on wheels for easy transport. Additional shelves can be added to the lectern if needed. 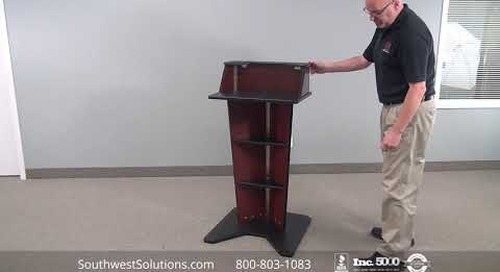 You can also order this lectern with a pre-installed flip shelf on the left or right-hand side for projectors, laptops, and other electronics or supplies. A clean front faces the audience with a beautiful and modern furniture-grade laminate finish available in multiple colors. A large, flat work surface (23" W x 24" D) provides convenient space and storage for presentation materials such as notes, laptops, and monitors. The adjustable interior shelf includes a cable pass-through for clean and organized wire management. The clean furniture-grade laminate finish is available in multiple colors. The open lecterns' versatility makes them great for a wide variety of applications in offices, retail, customer service, public speaking events, classrooms, and more. 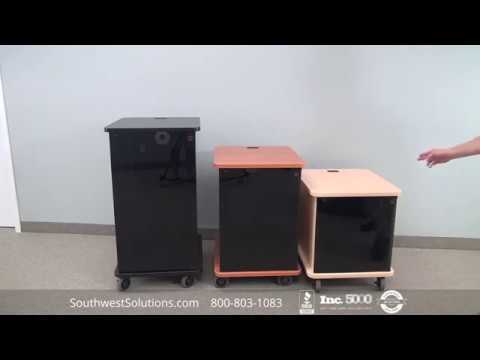 For more information about open mobile lecterns and speaker podiums, call us at 1-800-803-1083 or email info@SouthwestSolutions.com. Visit us on the web at http://www.southwestsolutions.com.